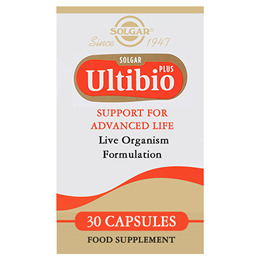 Solgar® Ultibio Plus is a non-dairy formula containing Lactobacillus plantarum LP299v™. 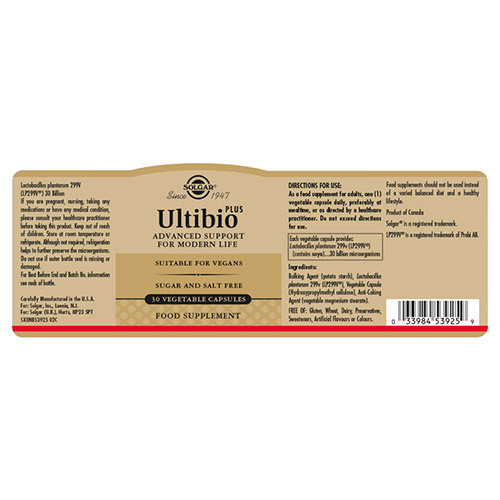 Each capsule provides 30 billion microorganisms* of this specially cultured strain; a beneficial microorganism which survives stomach acidity and has over a decade of scientific review behind it. Lactobacillus plantarum LP299v™ is a strain of friendly bacteria which can naturally be found in the intestines. The intestines are responsible for digesting food, producing certain vitamins and assisting the immune system. 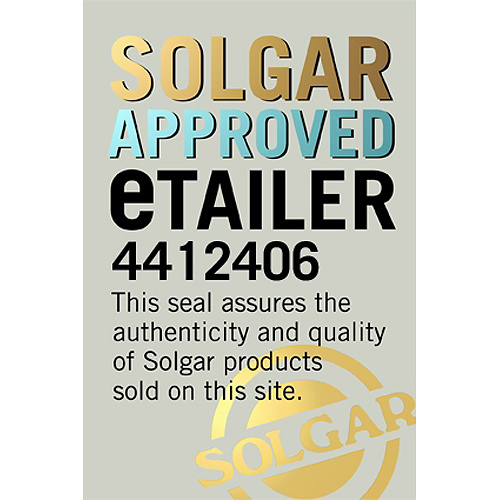 The strains used in Solgar® Ultibio Plus has been researched for over 10 years. Studies have revealed the ability of this specific strain to survive the harsh stomach acid following digestion so it is delivered directly into the digestive system. Solgar® Ultibio Plus is a safe way to increase the level of friendly bacteria in your gut. One vegetable capsule a day will provide 30 billion of microorganisms of this well researched strain. Bulking Agent: Potato Starch, Lactobacillus Plantarum LP299v™ (Contains Soya), Vegetable Capsule (hydroxypropylmethyl cellulose), Anti-Caking Agent (Vegetable Magnesium Stearate). As a food supplement for adults: Take 1 vegicap daily, preferably at mealtime, or as directed by a healthcare practitioner. Do not exceed directions for use. Store at room temperature or refrigerate, refrigeration helps to further preserve the microorganisms. If you are pregnant, nursing, taking any medications o have any medical condition, please consult your healthcare practitioner before taking this product. Below are reviews of Solgar Ultibio Plus - 30 Vegicaps by bodykind customers. If you have tried this product we'd love to hear what you think so please leave a review. 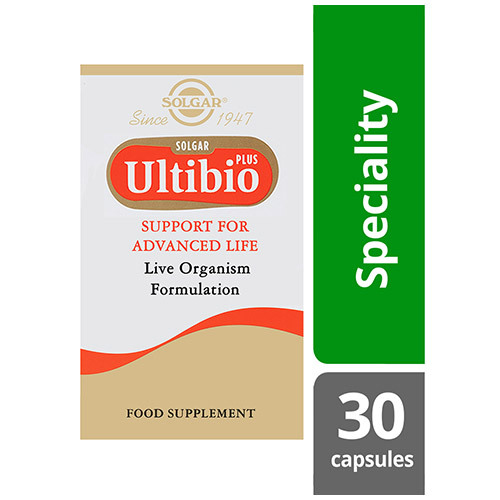 Solgar® Ultibio Plus is a non-dairy formula containing Lactobacillus plantarum LP299v™. Each capsule provides 30 billion microorganisms* of this specially cultured strain.